Alejandro Ocana Jr., otherwise known as 2Mex suffered complications from diabetes resulting in the amputation of his right leg from the knee down. If you know 2Mex personally, or through his work, you know that he has the biggest heart and puts everything he has into his music and into helping others. 2Mex has been what we call "the hardest working man in underground hip-hop" over the past 20+ years. An extraoridnarily talented artist, his family of crews include Of Mexican Descent, Visionaries, Mindclouders, SonGodSuns, The Afterlife, The Shape Shifters, The Returners, Look Daggers, Grimm Image, along with countless friends throughout the industry. 2Mex has also been throwing concerts and has the 2Mex Hologram Podcast, and the 2Mex Hologram Radio Show on 93.5 KDAY. 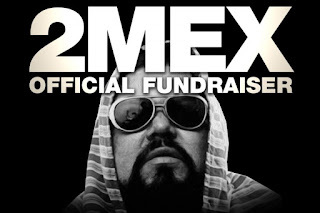 If 2Mex has touched your life in any way, he would be more than appreciative of any contribution made toward helping him with the numerous medical bills and costs (hospital, rehablilitation, equipment). on behalf of the Visionaries, family, and friends of 2Mex.